According to the AA*, the marginal cost of a mile driven in Edinburgh is 22.8p, meaning that after somewhat less than 750 miles, I will have spent as much driving around town as I would have buying a Carry Freedom Y-frame trailer. Quite apart from that, the trailer also offsets the purchase of a pannier rack and panniers, which I otherwise wouldn’t use (except for touring, but we do plan to go touring). 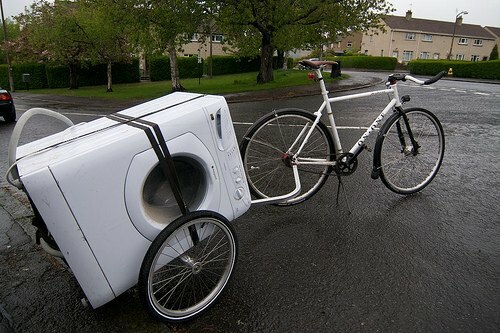 The cheapest imaginable pannier rack and panniers cost £80 from the LBS, about half the cost of the trailer – but you can’t easily carry random bike frames, boxes, or the recycling on a pannier rack, and the rack is always on the bike (unless you have a lot of free time on your hands). On the other hand, we already have good-quality drybags and other luggage that will fit right on the trailer. What’s great about the Carry Freedom? because you can’t ride in the gutter, you don’t. While I ignore dangerous or inconvenient cycle facilities as a matter of routine, the nice thing about the trailer is that it’s easy for drivers to understand why you’re not riding 5cm from the kerb. when they do eventually overtake, everybody gives you a wide berth, perhaps rightly afraid of having the side of their car torn apart. No taxi is going to try skimming past in the bus lane with this on the back – it’s almost like having a recumbent. you can still filter on occasion (route dependent) because it’s only a little wider than your handlebars. Mine is 70cm wide. Sure, you can’t skim down tiny gaps, but it’s surprising how little it holds me up in central Edinburgh. it packs completely flat for easy storage in the smallest of bike cupboards. Not only that, it packs flat in literally ten seconds – that is GREAT. You can still steer at full lock in both directions thanks to the flexible hitch. If the bike falls over, nothing gets damaged hitch-wise. I have tested this already! you end up with a ~100g connector on your QR, but otherwise after taking 10 seconds to unhitch, your bike is just as fast/slow as it was before you bought a trailer. What’s annoying about the Carry Freedom? Although it comes with two reflectors, these hit the ground when the trailer is unhitched, and I don’t think they’ll last long. There’s no obvious place to put the legally-required tail light, although a number of bodges suggest themselves. Sometimes you want to fly between stationary vehicles like the urban transport ninja you are. Having a trailer definitely makes you more vehicular. The trailer rattles like a demented castanet player on the cobbles. Who cares in town, but before going on tour you’d want to fix this. I didn’t buy one earlier, it would have paid for itself ten times over by now! So far I haven’t had anything remotely heavy on it, but the trailer is rated up to 90kg (or more precisely, safe braking on the tractor unit is the limiting factor here. Jack-knifed bikes holding up traffic in town would get the Evening News frothing! I’ll post an update on how I’m getting on in due course, and pictures/video of course. Update: see my growing collection of trailer adventures elsewhere on the site. * for us. Assumptions available on request. Why are trailers never designed with places to put lights on? I just don’t get it. Sorry for the rattles, maybe they’re just a design nod to my farming background, or perhaps they’re just annoying. I’ve kept tolerances slightly loose on the trailer to help long term reliability but at the price of rattles. There are three sources of noise, the handle/frame joint, the axle joint and the spring gates on the locking pins. The locking pins can be deadened by wrapping tape around the spring gate, while the axles with careful adjustment are not as noisy, and the handle deadens when the trailers loaded. A trailer needs a lot less tyre pressure than a bicycle, loaded about 20-30psi and unloaded as low as 5psi works, running these pressures will also kill the noise a bit. I’ve been working on a combination light mount/flag mount this summer, a few prototypes went out to customers and I’ll probably do a series production over the winter. Simple City, High Clunch Farm, Stewarton, Ayrshire, KA3 5JT, UK. I have the tyres at 50psi, so I expect at least one easy improvement! re: the light – I am thinking about getting the handle as I successfully shopped with the Y-frame in the local supermarket, but only by turning the hitch 90 degrees, and even then it needed a bit of thought to steer! If so, it would be easy to stick a light on that. I’m going to do another wee write up when I’ve ridden the trailer a bit, and thought through any changes. I bought my Y-frame Large in 2010, I also possess the 0.9m extension arm. The longest load (with the extension arm) I’ve carried was 3.2 m (a bit too long for the 0.9m arm). 2.4 m (0.9m load-length limit) fence posts are no problem. I have owned several trailers and if I had bought the Y-Frame first, I would have never have bought the others. It has coped with a wide range of loads: From bicycles; concrete rubble; bicycles; soil; tools; long length of timber and even a demonstration placard. My Y-F L was supplied with two bike-type reflectors, these aren’t adequate. Mounting lights is a problem. But IIRC all trailers that I investigated at the time were little different. I subsequently discovered that trailers need a triangular rear reflector with an ECE mark III or IIIA, to be road legal. I am not aware of any bicycle trailer so equipped, but I have not been researching this for some time, so I might be out of date about this. I have fitted a bracket with mast and the required triangular reflector. Dual lights: A steady German StVZO K-rated road-legal light and RVLR legal flasher. In my previous comment, when I used the term ‘road-legal’, I meant to state ‘road-legal after lighting-up time’. Please help me out here.I really enjoy my y frame flatbed trailer…but the bolts within the attachment system keep snapping.I need another system system to attach the trailer to my bike.What to do?